Described as a game-changing cruise ship, the vision was to create something truly unique that would enable guests to enjoy the beauty of the Mediterranean sea. The design of the ship is based on a modern beach condo concept with innovative features to enhance the enjoyment of the open water and sunshine. 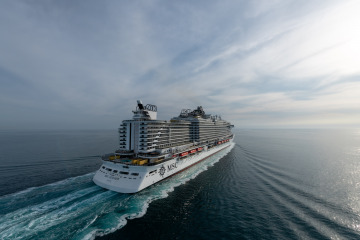 Specifically designed to cruise in warmer climates, MSC Seaview has been designed to create a connection between guests and the ocean. Most cruise ships are designed and engineered to offer entertainment, dining and other experiences inside the ship while MSC Seaview is designed to bring guests closer to the sea and enjoy the outdoors with to the outside of the ship to the open decks and walkways. Featuring the highest ratio of outdoor spaces of any MSC Cruises ship, MSC Seaview enables guests to enjoy the outdoors in every aspect of their life on board, from staterooms and suites with outdoor spaces such as terraces and balconies, eating and drinking in true Mediterranean style “al fresco," and outdoor fitness and luxury spa cabanas in the open air.